Boot levers are usually a rectangular piece of wood or plastic with a 'V' or 'U' shape at one end. 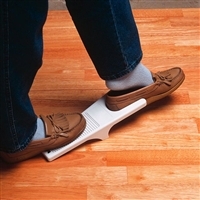 They may assist you to remove your boots or shoes without bending down to hold the shoe or boot. To use a boot lever, place the heel of the boot or shoe into the 'V' or 'U' shaped end of the remover. 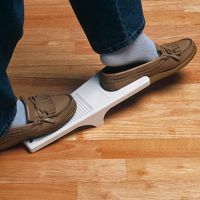 Your other foot should then be positioned on the other end of the remover to hold it steady while you ease your foot out of the boot or shoe (Disabled Living Foundation, 2008).